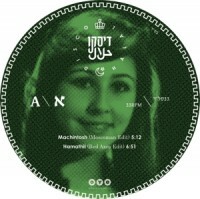 After a chance, boozey meeting between OYE's Delfonic and Berlin based Tel Avivian Mowscoman back in the latter's home town, the excellent Disco Halal came into being with a sell out compilation EP. Now the dust has settled, the hookah begins to bubble for volume two. This time round, Moscoman is joined by two leaders of the Israeli new school, the infamous Red Axes and Whiskey Disco affiliates Rabo & Snob, alongside a fresh face on the production scene, Sofia's Kmtr. Moscoman takes the lead with "Machintosh", a rolling, rattling percussion number topped with chanted vocals and see-sawing fiddle and mangled synth. Red Axes make the most of their moment in the spotlight, delivering the show stealing "Hamathil", a dubby groover in the vein of "Iko Iko", complete with didgerido sequences, chanted vocals and handclaps. When you chuck in the killer percussion, low slung bass groove and occasional burst of screaching guitar, you've got all the ingredients for a winning track. Rabo & Snob take us further into wonky cosmic territory on the flip, getting low, slow and funky on "Hilbeh", a bass and clav led groover that'd have me throwing the strangest shapes you've ever seen in no time. Proggy synths reach for the stars while occasional blasts of breathy female vocal coo away, paving the way for a deep and dirty acid line. Last but not least, Kmtr makes his wax debut with "Sorarim", a syrup disco stomper which slowly builds into an all guns blazing, orchestral funk number perfect for at least a thousand and one Arabian nights! Yalla!